The athletes competing in the 1960 Rome Olympics included some of the most honored in Olympic history: decathlete Rafer Johnson, sprinter Wilma Rudolph, Ethiopian marathoner Abebe Bikila, and Louisville boxer Cassius Clay, who at eighteen seized the world stage for the first time, four years before he became Muhammad Ali. Along with these unforgettable characters and dramatic contests, there was a deeper meaning to those late-summer days at the dawn of the sixties. Change was apparent everywhere. The world as we know it was coming into view. Rome saw the first doping scandal, the first commercially televised Summer Games, the first athlete paid for wearing a certain brand of shoes. In the heat of the cold war, every move was judged for its propaganda value. East and west Germans competed as a unified team less than a year before the Berlin Wall. There was dispute over the two Chinas. An independence movement was sweeping sub-Saharan Africa, with fourteen nations in the process of being born. There was increasing pressure to provide equal rights for blacks and women as they emerged from generations of discrimination. 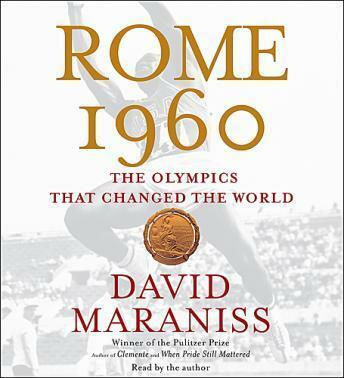 Using the meticulous research and sweeping narrative style that have become his trademark, Maraniss reveals the rich palate of character, competition, and meaning that gave Rome 1960 its singular essence of theater, suspense, victory and defeat.